Sandman grew up hearing tales about Kohler from his great grandmother, Emma Kohler Bertleau, who lived in San Francisco. He remembers her telling him about her family’s trips to its famed Tokay Vineyard in Glen Ellen in Sonoma County. Phylloxera later destroyed the vines and the writer Jack London acquired the property in 1911. Today the area is the Jack London State Park. 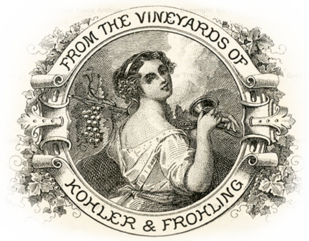 A sign commemorates Kohler & Frohling’s old winery there.